BGDCL Written Exam Result Download 2017 has been found my website also BGDCL Official website. 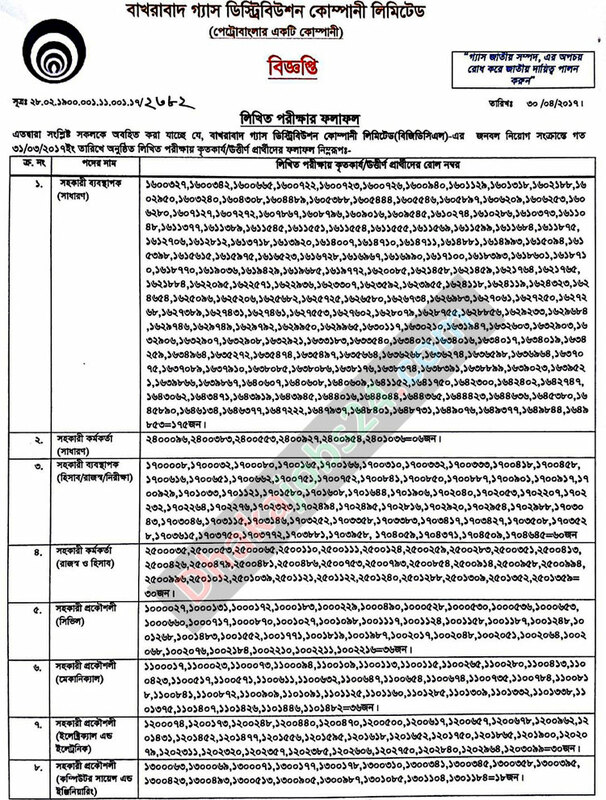 BGDCL job vacant position online apply starts 1st November, 2016 at 9.00 am and continue up to 20th November, 2016 at 5.00 pm. Bakhrabad Gas Distribution Company Limited has been published various categories job position. Bakhrabad Gas Distribution Company (BGDCL) as a model company in the Gas sector with the responsibilities of Gas production, transmission and distribution. Bakhrabad Gas Distribution Company (BGDCL) under the Petro Bangla company job Circular 2017. Bangladeshi all Gas companies job circulars update news will be found my site. ■ Job Title: Assistant Engineer (Civil, Electrical, Mechanical, Technical, Computer Science and Engineering), Medical Officer (Female), Assistant Manager (General), Assistant Manager (Accounting/ Audit/Revenue), Deputy Assistant Engineer (Civil, Electrical, Mechanical, Computer Science, Auto Mobile) etc. ■ Job Description: This job position is experience, talented technical person of this organization and forward to the bank authority for further review and selection purpose. Bakhrabad Gas Distribution Company Job is very attractive job circular in Bangladesh. Bakhrabad Gas Distribution Company is now very dependable Government service team in Bangladesh. Bakhrabad Gas Distribution Company Ltd. (BGDCL) has been published total number of job vacancies are eighty six (86). Bakhrabad Gas Distribution Company Job Circular 2016. Bakhrabad Gas Distribution Company job is the best attractive job in Bangladesh. So you can apply these Organization job vacant posts. Bakhrabad Gas Distribution Company Job Circular 2017.